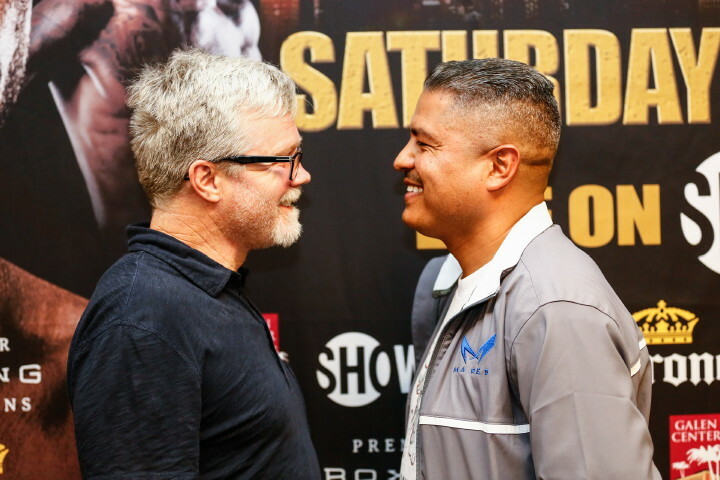 Four of the top trainers in the sport, Freddie Roach, Robert Garcia, Ronnie Shields and Stephen Edwards met with media in Los Angeles to discuss their fighters’ respective showdowns this Saturday, December 10 from Galen Center at USC and live on SHOWTIME®. Saturday’s event is headlined by featherweight world champion Jesus Cuellar defending against former three-division world champion Abner Mares in a long-awaited showdown. The SHOWTIME CHAMPIONSHIP BOXING® telecast begins at 10 p.m. ET/7 p.m. PT with junior middleweight world champion Jermall Charlo and top-rated challenger Julian Williams in a world championship battle of undefeated rising stars in their prime. Tickets for the live event, which is promoted by Ringstar Sports and TGB Promotions, are on sale and are priced at $35, $50, $75, $150 and $200. To purchase tickets go to www.galentix.com. Roach (Cuellar), Garcia (Mares), Shields (Charlo) and Edwards (Williams) spoke to media at the Sheraton Los Angeles Downtown about their fighters and the highly anticipated matchups taking place this weekend in Los Angeles. How has your relationship with Cuellar developed? “I’ve gotten to know Cuellar quite well and have spent a lot of time with him. I think he’s learned a lot and I think he’ll carry that into the fight with him. He’s prepared and he won’t go out there just trying to look for a knockout. He’s a good puncher and everybody thinks he’s looking for the KO, but I told him to just let it happen. If you force it, it will never happen. “I don’t really know how their relationship is and I don’t really know how long they’ve been together. I heard that during his training camps that he had gone to Florida for another trainer so I don’t know how great they’re really getting along but again, I don’t really worry about the other side so much. I know my guy is ready for a hard 12-round fight. What are you predicting for Cuellar? What’s the game plan if Abner comes to box? “Cuellar is very strong and hits really hard. He has tremendous power. He’s very strong physically and mentally. He has that warrior mentality that just goes out there looking for the knockout. “I don’t have the secret recipe. It’s just that I know Abner is in great shape and we’ve had a year to prepare for this fight. And I know Cuellar very well. I know how he thinks and that could be a plus. I think facing a guy I used to train can be an advantage for us. “I know Jesus and how he is in locker room. And I can use that against him. Even though he’s with a great trainer in Freddie Roach, he has never walked out to the arena with him. I did it for five fights and for two years. But I don’t think I need those advantages. What has impressed you most about Abner this camp? Did you always have aspirations of becoming a trainer? “Never did. It’s funny how it happened. When I had my last fight at 26, my plans were to forget about boxing. I hated boxing. The last couple of fights I had I didn’t want to be in the ring. I didn’t want to have anything to do with it. But then I started to come around my Dad’s gym in Oxnard (Calif.). The thing that I loved the most was the travel — because I traveled around the world during the amateurs and the pros. My first three fights were in Japan. But we didn’t enjoy it. I was always trying to make weight. And I never got to enjoy it. But I never thought I’d be in this position to train nine world champions. Who is your pick for Trainer of the Year? Have you gotten the credit you are due? “All I hear is Charlo is scared. Jermall isn’t scared to fight anyone. Why would a guy who is champion of the world be scared of fighting [Williams]? “Jermall and Julian ran into each other a few times as amateurs, but not as professionals. I think they both realized they would meet in the ring and that it would happen. How do you think this fight will end? What does Julian Williams do well? What is underrated about Jermall that fight fans might now know? “I think that a lot of people don’t know how smart an individual he is. Outside of the ring, and inside of the ring. He’s so different than he appears in public. He’s a really quiet guy and does not really boast a lot. “These days you see a lot of fighters using different guys, and not just the same guys [in terms of trainers]. I think a lot of fighters are trusting different people, and not just the same guy. “We were ready for this fight, maybe a year and a half ago but unfortunately it took a bit longer than we thought to come into fruition. But he’s had a great camp. I know Jermall is a formidable fighter, he has a great coach and I’m expecting a great fight. I think it’s really, really difficult to beat an undefeated fighter that does not know how to lose. Did he open up to you about his story shortly after you knew him? “If I could just get him to buy into a diet, buy into doing things the right way, he could be a world champion. I think that I believed that he was going to be a world champion before he did. That’s how the stories started to unravel about his homelessness, that he didn’t have anything to eat, that he would work at McDonalds and other places and that would be his diet. How much do you think his past goes into the way he fights? What can you say about Jermall?